Christmas has just passed and we have eaten our share of Gingerbread cookies. Below is a recipe for some really delicious Gingerbread men cookie that can be made year-round; why not? 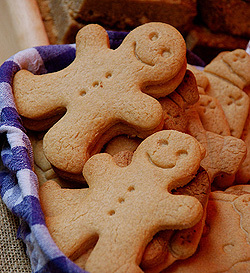 Gingerbread does not have to be just for Christmas anymore! These Gingerbread cookies make really nice home made gifts especially when wrapped in cellophane and tied with a lavish bow. Recipe Here.